Objective: To learn how to collect your customer database and motivate them to perform future purchases using a loyalty program. Now you will learn how to register a new customer of your business, credit and redeem their bonuses. You can add a new customer to your loyalty program through the Register. It is a system of sales accounting. The Register is a workplace of your salespeople. When the salesperson specifies the fact of the sale, loyalty rules are automatically applied to the customer, which gets a discount or bonus points, promised earlier. 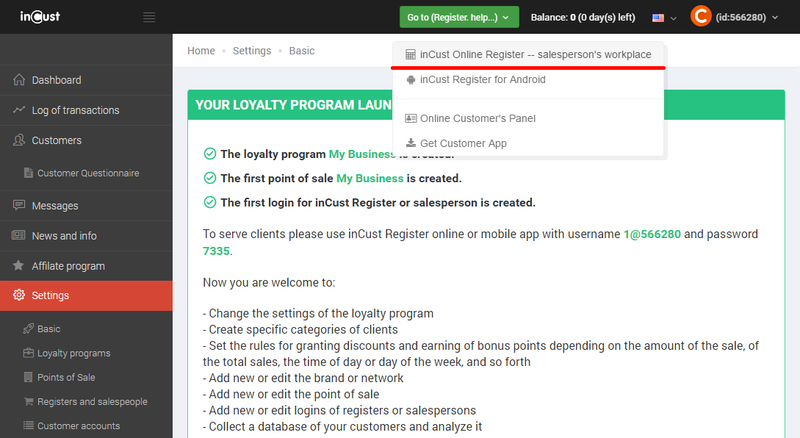 In order to enter the inCust Register – Sales workplace, you have to enter your login and password. Copy it from the Control panel or enter the one which you have saved in the previous lesson (don’t confuse it with a login/password to the Control panel). In the Register you see a field for entering the customer’s phone number. This is the main way of identifying the customer. You can also connect the scanner to your computer and scan the QR-code from the customer mobile app. If this is a new customer, you will see the ‘New Customer’ text at the top of the screen. In this table you will have to fill the fields of the customer’s profile. Attention! If you made a mistake while entering a number, click ‘Choose another customer’ and re-enter the number. Then click ‘Close’ to go directly to the sell transaction. You will learn how to change the fields of the form and set the way they are displayed in the Register in the following lessons. Click ‘Close’ and then enter a sum of money in the ‘Amount’ field. The loyalty program, which you have set up during the registration, will automatically calculate the amount of bonus points to be credited. Click ‘Next’ to proceed with the operation. A window with information about the transaction will be shown. Click ‘OK’. Now the customer will receive an SMS message from your business with information about received bonus points. The SMS will be sent to the phone number, entered earlier for this customer. You have registered the first customer, recorded her first sale and credited bonus points to the customer account! Let’s learn how to redeem the bonus points with which you have just credited the customer. Enter the phone number again. Information about existing customers is displayed in the upper right corner of the screen. By tapping the button you can open a window with information about the customer. Go to the sale and again enter sum in the ‘Amount’ field. Then, in the ‘Redeem bonus points’ field, enter the amount up to the one specified in the SMS message. Then click ‘Next’. In order for you to be sure that the customer spends the bonus points they own, SMS message with the security PIN code is sent to the customer’s phone number. In the ‘PIN from SMS’ field enter the code, found in the SMS message, sent to the phone number indicated in the ‘Customer’s phone number’ field (you would need to ask the customer for the PIN). In Control panel click ‘Customers’ section in the left-side menu. In the table, that appears, you can see a phone number, which was used in the transaction. Let’s learn how to keep in touch with the customer. In the ‘Actions’ column next to the customer phone number click or tap ‘Details’ button. You’ll see all the available information about the customer. In the upper right corner click or tap ‘Actions’, then click or tap ‘Send message to customer’. Smart-message, which makes a push-notification, if a customer has the inCust mobile app installed on his smartphone, and an SMS message, if they don’t have the inCust app. Write the name of your business before the message text in the Message Body field and click or tap ‘Send’.